CirrusMD Executive Access is designed to help leading healthcare influencers understand what sets the CirrusMD care experience apart from run-of-the-mill telehealth options. When you’re invited, you’re granted 3 months to enjoy the experience of accessing a live physician whenever you need, wherever you are. We'll keep in touch to see how your trial is going. NO PAYWALL. Never pay up-front to access care, ever. NO HASSLE. 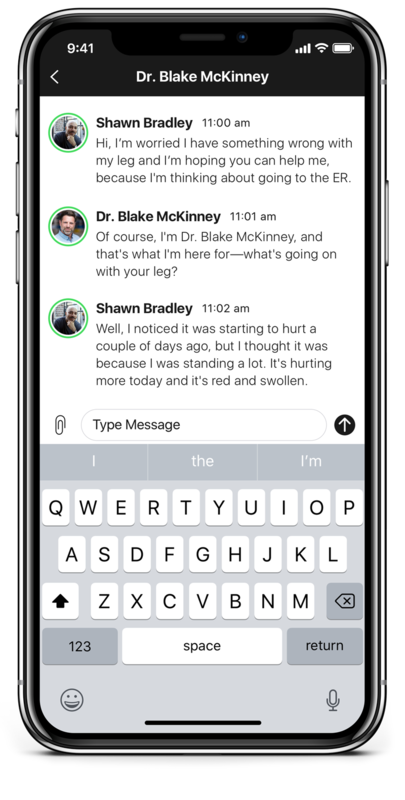 Connect to a doctor in under a minute via an accessible chat interface you’ll love to use. Access care on your time, and on your terms - whenever you need. NO TIME LIMITS. Your conversation with a CirrusMD Provider Network physician doesn’t end until you get the answers - and the peace of mind - you need. NO UNCERTAINTY. Care shouldn’t end with a diagnosis. CirrusMD physicians are here to seamlessly guide you to the resources you need to navigate your full care journey. After applying, one of our team members will reach out to you to explain the program in more detail. If you don’t hear from a team member within 2 business days, please email us at getstarted@cirrusmd.com.